Cyberbullying is any online post, blog, article, or even a show of support for writing that insults one person (or a group) who thinks/acts differently than what the bully considers ‘good’. It’s easy to identify. If you read something online that uses insults, opinions, or judgments to demean the person/persons, that considers a person/persons stupid or inferior because s/he/they think this way, and that doesn’t take into account why those other actions/ideas might be valid from the person’s perspective, that is cyberbullying. Screaming at people rather than carrying on civil discourse is bullying, be it online or in person. More examples include mean texts or emails, insulting snapchats, embarrassing photos or videos, rumors posted on social networking sites, unsubstantiated lies presented as truth, and insults to people who believe/think differently. It gets worse every year as the Internet plays an increasingly dominant part in kids’ lives. Exponentially worse. Because this crime occurs in the vastness of the world wide web, the bully hides behind their handles, buttressing their actions by the acceptance of others. What makes it even harder to identify and less likely to solve is that kid–and adults–often are reluctant to ask for help. Meaning, it’s someone else’s responsibility to stop the bullying. Parents think they’re invading their child’s privacy by monitoring social media accounts and teachers think they don’t have enough time. But really, if not you, who? Be open-minded. No matter how strongly you believe you hold the righteous opinion, someone won’t agree. Respect their right to think differently. Discuss this topic with your child every year, starting as soon as they use multi-player games (often as young as second grade). You think they’re OK because you disabled the online access — think again. These clever digital natives take figuring out how to circumvent your protections as a challenge. Once the emotional damage is done, it’s difficult to undo. Consider sources for your opinions. Are they balanced, neutral sources? Are they gossipy? Did the source present both sides? On a personal note: I am bullied, often, mostly for my beliefs but sometimes for more than that. Usually, it’s from the safety of an online ecosystem but occasionally, it’s in person, by people I trust, never expected to see this from. As a result, I found this article wrenching to write. The crime is so ugly, destructive, and in the case of kids, affects our most innocent. But it must be addressed. These resources are a starting point. Don’t wait to get involved until it’s too late. In my opinion, bullies are cowards, they always surround themselves with followers who are too scared to say no. Unfortunately, with technology they can now hide behind their devices. It is time we all say enough! And its not just in the schools, workplaces are just as bad. You are so right, Luciana. When it was rare, we could turn away, figure it would go away, but now, that seems to empower bullies. Kids need strategies for dealing with it. Dolly Everett was a young girl in Australia who killed herself in Jan this year because of online bullying. It led to a cybersafety campaign. We monitor the Barbarians, but we don’t let them have phones yet. It means they don’t do social media and we haven’t had any problems with cyber bullying (etc). We’re especially careful because one of the Barbarians was bullied for nearly 5 years and it was bad enough face-to-face without adding the cyber world to it. Parental involvement is critical to solving this–doing what you’re doing. Even the bulliers would step back if their parents got involved. I’m so sorry to hear about Dolly. We can’t afford to lose our youth, especially over something like bullying. Sigh. It is. But kids aren’t defenseless victims. That’s a myth. Not true. This really is one of the down sides of the internet, Jacqui. Bullying was bad enough in my day but when done in an on-line public forum it is horrific. The best way to fight it is to teach kids they aren’t powerless. They can fight back (in whatever way that means). Last year, a local thirteen-year-old boy committed suicide because of bullying. His family had no clue what he was going through, and it’s so heartbreaking. This is a clear example of families being too busy. We have to take the time to check in with our kids. Just the other night, my son (13 y.o) had a terrible day at school and he acted out during a soccer game. I saw that it was out of character for him, and while some people assumed it was because they were losing the game, I knew better. Because I know his triggers. Sure enough, when I talked to him later that night, turned out something had happened at school–and he couldn’t shake it in time to play a soccer game with a clear head. I spent over an hour talking to him and giving him options and going over resources, reminding him that he is LOVED. I had dishes in the sink, a deadline to meet, a client call to return, I was beyond tired at the end of a long day–but nothing should stand in our way of connecting DAILY with our kids. They are far too precious to leave hanging, even for a day. Oh, Kate, I am so sad for that 13-yo in your neighborhood. It is difficult to notice, that cyberbullying, but I think like you did–if parents check in daily, pause to notice, they see those changes that signal something’s wrong. The second piece I think is often forgotten is to empower kids to fight back–whatever that might mean, however small that is. They aren’t powerless or victims. I lost a lot of jobs raising my kids and I don’t regret a single time I put them ahead of work. It’s just what had to be done. I hope your son is getting through his difficulty. This is why I teach my students to ‘see something say something’. Don’t ignore it. Do what you can, if you can. I’m so sorry you went through that in school. Thank you for a very informative post on an extremely important issue. I tend toward upbeat on my blog but my teacher side took over here! It seemed the right time to discuss this, with this month’s theme. I appreciate your feedback. You are most welcome, Jacqui. Oh, so right you are. I have a difficult time with bullying co-workers. They even sit there and text each other, instead of traditional gossip. These people should be removed from the workplace. I have worked there for 25 years, and some of these young people are trying to push me out of my job. The other day somebody came to me and told me that one of the perps was a girl who had a difficult childhood. I was so mad. I did too, but I never took it out on anybody. It’s likely that I have to quit my job to avoid the emotional damage that has gradually occurred. I spoke to a union person and voiced that these people start in grade school and then the trend continues into the workplace. People managing are not always trained to deal with these issues. I am so sad for what you’re going through. I debated talking about how young bullies grow into adult bullies but decided I’d leave that topic for later. But, you are living exactly what happens when we don’t address bullies in grade school (or school). they think it’s OK. They think numbers make them right and anything goes. I’ve seen too much of it on TV, in the news, on the internet. It makes me glad I work at home. I was bullied at school in my teens back when there was no internet so I can see how cyber-bullying has proliferated, not least as the bullies can hide their identities. I have to admit that I have done little to help beyond standing up when I can and speaking out. I have just written a short fiction story with bullying at its core – it’s part of my detective’s backstory. In fact, it is the second short that touches on the issue. Is that only helping me? I’m so sorry to hear that, Roland. It used to be considered a right of passage in school but now we understand how destructive it is. I think, as far as doing what you can now to help others, really, you do what you can, nothing else. Writing about it is powerful and as a tangential piece can be even more effective than the central plot. If your character was bullied and came out of it as a detective, that says a lot. My detective might not be me, but she allows me to speak – especially as the bullying continues in a way. Some of her work colleagues have an attitude that is akin to cases you and others have addressed. I think anytime you include bullying and how people deal with it, you help victims. I’d love to read it when you publish. Many thanks, Jacqui. Early days so publishing is a distant intention – but it will be announced on my website. This is so upsetting, Jacqui. It’s amazing how brutal people can be. I ignore it, but I’m 60 years old. As a kid or teenager, it would have been devastating. 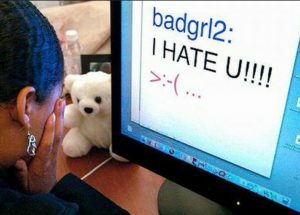 I hope that parents, teachers, teenagers, and kids will stand up to cyber-bullies. Thanks for the informative post and links. It really is upsetting. I post the information, videos, but that’s why I added the note to preview first. For many, it may be too distressing to be useful. Tuck the links away in case the day comes you need them for someone. Absolutely, Deb. It’s what so many of these cyberbullies rely on. We’re getting smarter about it, though. Soon (well, years), they won’t be able to hide. I too, an working at home, but only part-time. I am a brand new Copywriter. I am trying to make enough money so that can quit and focus on my writing. It’s only because I am not quite there yet. I am giving them my notice, and I am going to request an exit hearing to let them know why I am leaving early. Many of the problem people have addictions and mental illnesses. That’s fine, but health care is not the place for addicts when their behaviour is out of control. Great piece, Jacqui. Thanks so much. Thanks, Lynette. This is dear to my heart. I know you feel the critical nature of this topic also, Rich. Thanks for including the link to your wonderful book. There are people who hurt others just for the thrill. I don’t get it but I know we have to teach our kids how to recognize that and what to do. The figures are shocking, Jacqui. This is such an important topic, thank you so much for bringing so many useful links to our attention. They are shocking and not enough is being done about it. If it appears often enough around the Internet, maybe it’ll get more traction. Good idea, I’ll tweet it now. Thank you so much, Cath. This is an excellent post, Jacqui, and it’s obvious you did a lot of research before writing it. Bullying is an ancient activity, (I was bullied often because I was such an easy target) but the Internet makes it more pernicious and difficult to confront. I’m going to send this to my sons so they can be more vigilant for the sake of their own children. Thank you – one of the best public service articles available. The resources–some of them are frightening. Make sure he previews them first. They will break his heart. It is an important issue. Thanks for having the courage to write about it. I did struggle writing this because I–like others who have commented–have been cyberbullied. There’s a massive feeling of hopelessness when that happens. But if not me (to discuss it), who? Again thanks – I realize it can’t be easy to write about. I’ve rarely experienced this as I don’t put myself out there too far on the internet, but there is something about how the internet and people work that seems to generate this kind bullying. Bullies who fear facing others hide behind screens to bully. This needs to be addressed by teachers and parents by warning the kids before they come across bullies. I have seen it starts early and is often brushed aside as aggressive behavior and kids are expected to fight their own battles till they stop discussing. Thank you for highlighting this issue Jacqui. Well written! The problem is greater because of the fear–worry?–of infringing on kids privacy. Do we have the right to look at their social media accounts? Lots of adults struggle with that. I don’t so much. This is an excellent post, Jacqui. And so important. Thank you for bringing attention to this. I’m going to check out some of these videos. This subject brought to mind the Netflix series, 13 Reasons Why. I’ll have to look at that one. Thanks for sharing it. It’s very intense!! I watched season 1. There’s way too much cursing and adult content, but I guess it reflects what goes on today. I was more interested in why a young lady took her life. The series takes you through what led her to do it. And they actually show her take her life. It was very jarring to say the least. I added it to my Favorites. Oh boy that looks like a tough watch! Jacqui, it is a scary world and even more so as it is one that is often unseen. You give some great advice and links here. We have to start by teaching kids cyberbullying is wrong. Sometimes, they don’t even realize what they’re doing hurts others. They think they’re anonymous so safe. John Wooden (famous football coach) says, “The true test of a man’s character is what he does when no one is watching.” We need to help kids to believe that. And then, we have to work on the bullying adults. Yikes! Important to call attention to such behaviour. Thank you Jacqui! It is. It isn’t taught much in school (though they do address bullying and cyberbullying as often a unit–not iterative teaching). Adults become the model and that often doesn’t work well. Thanks so much for sharing this, Norah. Such a sad but very important post, Jacqui. Cyberbullying is dreadful with terrible effects. Teenage suicide as a result of it is heartbreaking. We have had some very sad cases over here too. Once one could only be bullied by others close by. Now it can occur from anywhere in the world. That you are bullied is sad too. Stay strong. You are not what they say you are. These stories break my heart. Parents often don’t learn about the problem until it’s almost too late, and then they feel they can’t do much about that. Sigh. The entire situation is so very sad. I don’t know why people have to be so cruel to each other. We need to learn to get along. Live and let live. Thanks for bringing attention to this serious topic, Jacqui. I see this often in my day job…it’s a big problem. This is the perfect month for it, being National Bully Awareness Month. Thanks, Jill. What a wonderful post, because it raises awareness and reminds us of the affects bullying can have. The resources are wonderful, and I hope lots of readers use them. I’m going to show my girls. They are older now and my youngest suffered cyber-bullying. I’m lucky that she discussed this with me and I was able to support her through it. I was bullied at school. There were days I wanted to hide under my covers and never leave my bed. It was before easy access to the internet, so I’m thankful that those girls couldn’t ‘follow’ me home and continue their campaign through a computer screen. I’m so sad to hear about your daughter. I do believe that by bringing it to you early, it (hopefully) lessened the impact. And you! I suppose that was before schools took a harder stance on bullying. I’m so glad you came through it with the great talents and positive attitude that I see all the time in your posts. Thanks, Jacqui…I’m lucky that I can bounce back and learned the tools to do that. Some are not so lucky and it absolutely breaks my heart. You hit the biggest piece of this puzzle. Parents must teach their kids not to bully and address it firmly when it does. There’s no one who has a greater impact than parents.